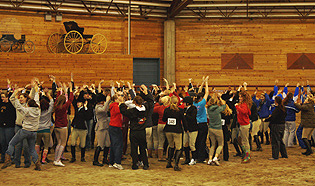 Once the classes ended, members of Zone 9, Region 3 create a dance floor on November 8th (Photo courtesy Molly Ryan/South Dakota State Equestrian Team). Crookston, MN - The University of Minnesota at Crookston tried something new to unite the region at the final Zone 9, Region 3 hunter seat show of the 2009 fall season. On November 8, during the second day of competing, all teams were asked to join in on a dance party held in the arena, this after the jumping course was taken down for the day. The dance party was to help relieve any stress or tension from competition, as well as bring the teams together for some fun off of the horse while still in the area. Leslie Sauter, a junior from South Dakota State University said, “We get so used to the routine of sitting and cheering with our teams that we sometimes forget we are more than just individual teams. We make up a region that should have fun together as well as compete with each other." 'Party in the USA' by Miley Cyrus started over the sound system and within moments the arena was flooded with a variety of members from Zone 9, Region 3 teams to join in on the dance.